I am pleased to say that this has been a fairly frugal month for me. Almost everything I have bought has been returned. As most of you know, sometimes I buy things and shoot them with tags in to show you. I don’t have the budget to keep everything I see and love, and I wouldn’t be a very good fashion blogger if I only showcased items that are no longer available to buy. However, some things are just too good to part with and today I want to let you know about the item that definitely won’t be going back. 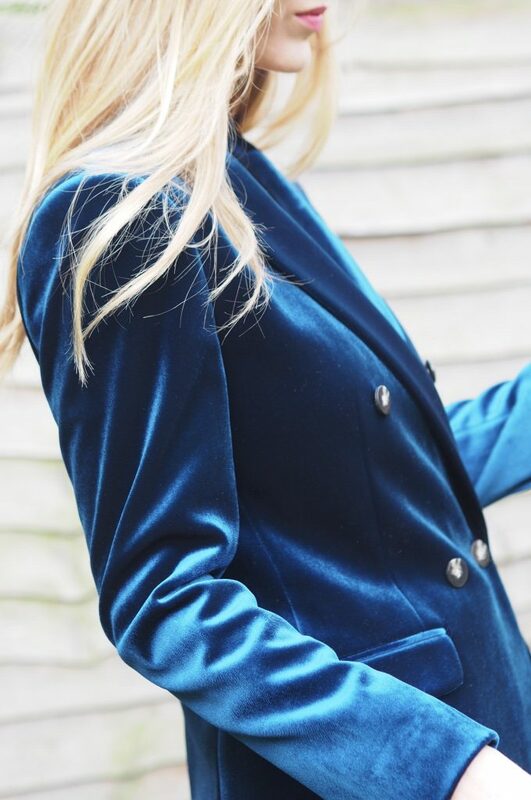 This teal velvet blazer from Topshop is the perfect addition to my wardrobe. I love the colour, the cut, the thickness of the fabric and the way it makes me feel when I wear it. I had my eye on the Whistles velvet blazer but at £219 it felt like a bit too much of a stretch with Xmas coming up. Then I spotted this one for £75 which felt much more manageable. 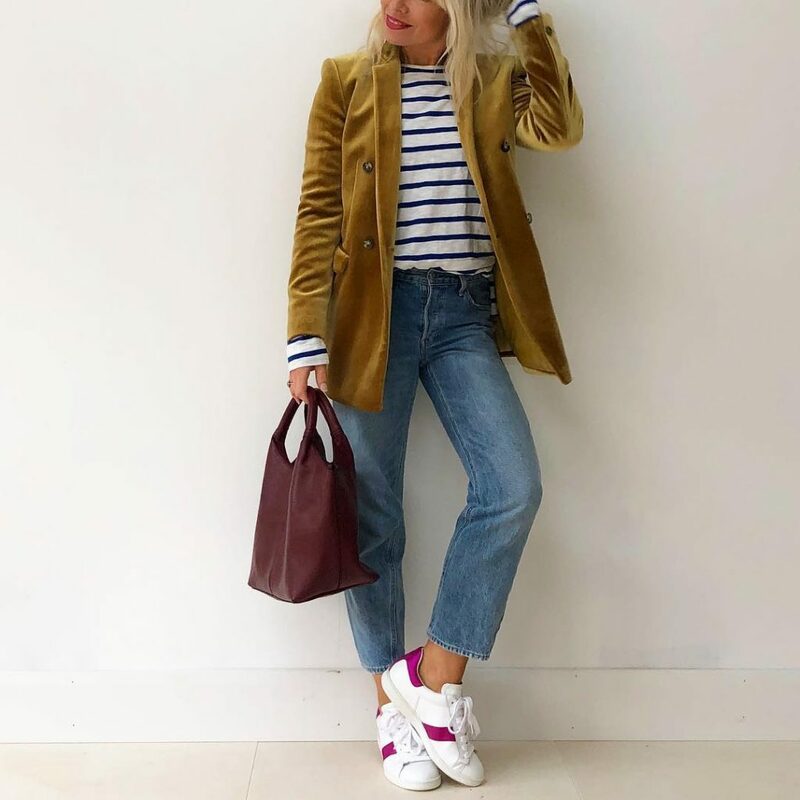 I do own a couple of black blazers and although not velvet, I would probably end up feeling guilty for adding a different version of what is essentially the same thing to my wardrobe. But teal velvet… I definitely don’t own anything similar! This time of year brings about more of those occasions when you want to feel a little more dressed up than usual. Day or night, this jacket will finish off your look beautifully. 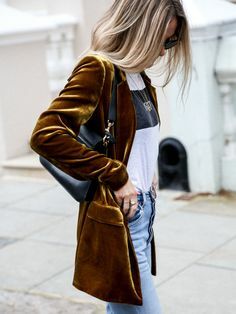 For an evening ‘do’ I would style it with a black satin camisole, black trousers and simple heels and for a daytime look I would pair with a plain white tee and jeans and let your jacket make the statement. Co-ordinating with my new Etsy cushion! The blazer also comes in a stunning mustard shade, which my friend Fran looks beautiful in. I love the way she has styled it with a breton top and trainers. Sadly I think the mustard one has sold out online. And here are some images via Pinterest for a little style inspiration. I love the blue however Austin Powers wise cracks would in full flow from my family and then I would never wear it. Another colour though?? Such a shame that the mustard has sold out. 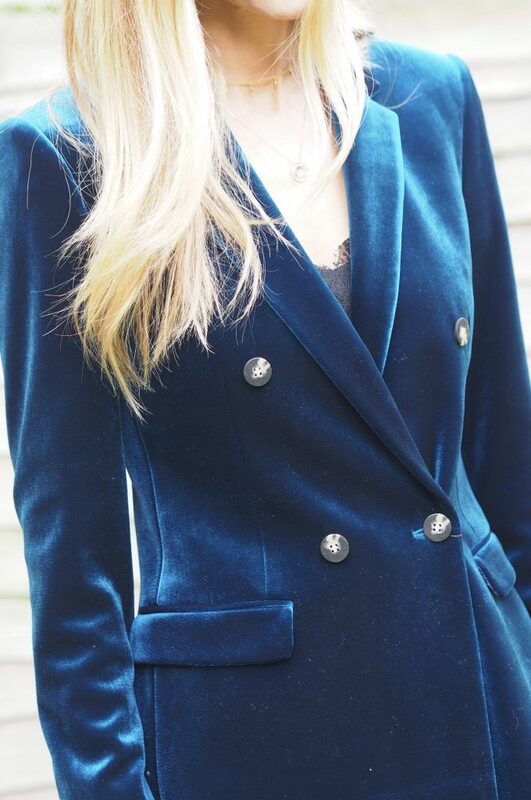 I so ‘need’ a velvet blazer, that blue is gorgeous, but sold out in my size. I did order the navy velvet one from Boden, but I really needed it in petite, the regular was just too big over the shoulders and a tad on the long side. The search will continue….